The Senior Honors Project (SHP) and the annual SHP Symposium, which is the culminating event of the SHP, represent perhaps one of the most exciting evolutions of community based education at SFIS. Envisioned by SFIS education stakeholders, including The Leadership Institute at SFIS, SHP began as a community based research project requirement for all seniors in Advanced Placement (AP) English classes in 2002. SHP quickly developed as a graduation requirement for all seniors. Through interdisciplinary coordination between the senior English teacher, the senior social studies teacher, and SHP Coordinator and SHP faculty team, the SHP is now a required, dedicated course. SHP provides students with guidance through a semester-long and thorough process of topic identification and development, serious academic research experience requiring contact and mentoring with community members and SFIS faculty, and development of communications and presentation skills, culminating in the annual SHP Symposium, which is attended by underclassmen, parents, community members and leaders in a multi-venue forum. To date, hundreds of SFIS students have been, or are currently involved in the SHP research process. Each year, SHP students will receive research and technology training, such as GIS training to apply geospatial references and representation in their research and to enhance the effectiveness of their communications. 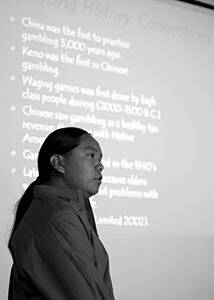 The SHP course is designed to improve students’ research, writing, and presentation skills through various projects that address real concerns in today’s global and local Indigenous communities. Students will use a variety of media and software programs to design professional-quality presentations that consider critical issues from multiple perspectives, within broader historical and global contexts. The culmination of the course is the Senior Honors Symposium, during which students showcase their research findings and multimedia projects for family, students, staff, school board members, and tribal officials. Students will also complete a community action project of their own design, related to their research and designed to improve the short- and/or long-term health of the community. There is also a college credit option. Students who qualify for and opt for college credit will complete and earn an 80% or higher on a 10-15 page research paper synthesizing their research and drawing viable conclusions about possible solutions/approaches to problems facing Indigenous communities today. Students will also plan, shoot, and edit a short documentary film or public service announcement (2-5 minutes) related to their project.